Georgia’s European Way: What’s Next? In his commentary, Steven Blockmans, Head of EU Foreign Policy at CEPS (Centre for European Policy Studies) analyses the frontrunner position of Georgia among the Eastern Partnership countries. The Association Agreement between Georgia and the EU enriches EU-Georgia relations and provides considerable financial and technical support to assist the country in its democratic transformation and socio-economic modernisation. Mr Blockmans defends that Georgia has advanced notably on its commitments towards the EU, sometimes even surpassing Western Balkan countries. 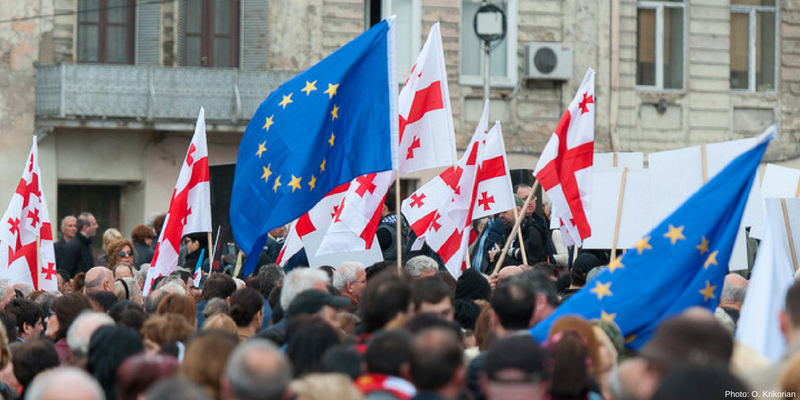 However, he questions the assumption among Europhile Georgians that now a further symbolic milestone should be identified on the path towards the EU. The new milestone should be conditional on continued progress of Georgia on the rule of law and other reforms. Of all neighbouring countries, Georgia is a frontrunner on the path towards the European Union. Although intra-EU politics towards the Eastern Partnership (EaP) separated it from other countries in southeastern Europe that have been granted an accession perspective, Georgia could theoretically meet the conditions for EU membership as spelled out in Article 49 TEU. This has been implicitly recognised by the Joint Declaration of the November 2017 Eastern Partnership Summit, which referred to the EaP states as ‘Eastern European countries’, a terminological reference to the EU membership clause. Perhaps in a sign of things to come, the approach of some member states in strategizing their financial and technical support towards neighbouring countries is no longer in keeping with the policy frameworks developed by the EU. The Swedish International Development Agency, for instance, now plans its aid towards a region encompassing the Western Balkans, Turkey and the EaP, irrespective of the classification of countries as belonging to either the EU enlargement or European neighbourhood policies. There is something to be said for this wider geopolitical approach to dealing with the eastern neighbourhood region. Firstly, the commitments to achieve EU political and economic standards and to adopt or approximate to EU law and policies made by Eastern Partnership countries, especially those whose bilateral relations with the EU have been enriched with a deep and comprehensive free trade area (DCFTA), are similar to those entered into by the Western Balkan countries. An in-depth comparison of the Association Agreements (AAs) and the most recent of Stabilisation and Association Agreements (SAAs) reveals that, in terms of scope, speed of legal approximation and level of enforcement, key parts of the DCFTAs actually surpass the SAA commitments entered into by the Western Balkan countries. Even if the latter are expected to eventually close the gap with the EU in their accession treaty, the long interim of 10, 20 or more years makes a comparison with the EaP countries both feasible and politically significant. Secondly, the three DCFTA states’ level of transformation is (above) average of that of the Western Balkan six. In the wake of the June European Council, the EU effectively ranks the Balkan states in three tiers according to their accession prospects: Montenegro and Serbia, with which membership negotiations are well underway, belong to tier one; Macedonia and Albania, with which accession talks should start in June 2019, are in tier two; Bosnia-Herzegovina and Kosovo, with which fundamental issues of statehood still need to be resolved, are in tier three. A recent cross-analysis of various political and economic indicators (Freedom House, Transparency International, World Justice Project’s Rule of Law Index, UNDP Human Development Index, EBRD Transition Indicators, World Bank Ease of Doing Business Index, etc.) shows that Georgia is slightly ahead of the Balkan tier one, while Moldova and Ukraine are more advanced than the third tier and compare better to the second Balkan tier. The European Commission has recognised Georgia’s frontrunner position by agreeing to an annual meeting of the College of Commissioners and Georgia’s political leadership. In taking this symbolic step, the Commission has softened its erstwhile position of defining the ENP under Romani Prodi as ‘everything but the institutions’. To be sure, meeting with the College does not equate with being part of the Commission. Notwithstanding geopolitical pressures and other obstacles there is a broad consensus in Georgia on pursuing the goal of European integration. For its part, the EU acknowledges Georgia’s European aspirations and provides considerable financial and technical support to assist the country in its democratic transformation and socio-economic modernisation. Georgia has concluded an EU Association Agreement (AA) which includes a Deep and Comprehensive Free Trade Area (DCFTA) and its citizens enjoy visa free travel in the Schengen zone. The assumption among Europhile Georgians that, now that an annual meeting with the College of European Commissioners is on the books, a further symbolic milestone should be identified on the path towards the EU, is not a given. It is conditional on continued progress of Georgia on all above-mentioned indicators, in particular the rule of law. A recent study shows that the integrity of the judicial reform process is on trial in Georgia – with regretful regression and artificial delays in implementation. Georgia should correct its overall course of action before asking for more. The offer by the European Commission to let the College meet on an annual basis with Georgia’s leadership is unique when comparing it to relations between the EU and other third countries. Not even the countries of the European Economic Area (Norway, Iceland and Liechtenstein) and Switzerland, whose economies are deepest entwined with the EU’s single market, can pride themselves with such an advanced format for dialogue. At the highest political level, the EU does not organise bilateral meetings other than with strategic partners like the US and China. Under pressure of the refugee crisis, the EU has met with Turkey on a number of occasions. And as a result of the momentous developments in Ukraine in 2013-4, a bilateral summit was foreseen in in its Association Agreement, thus providing for annual photo opportunities between the Presidents of Ukraine, the European Council and the European Commission. Apart from the high-level pageantry, the summit is also a moment for frank talk and critical reflection about the tough reforms that the country needs to carry out. Implementation is driven at the ministerial level within the Association Council. This format for dialogue on bilateral and international issues of mutual interest, including regional aspects is replicated in the AA with Georgia. The word ‘dialogue’ is mentioned 78 times in the AA, with reference to issues belonging to the world of high politics as well as technical cooperation. Various formats cater for such diverse level interactions. If it is visibility with the public that Georgia is after, then this is more a matter of good PR (on both sides) about the precedent-setting nature of the annual meeting with the College of European Commissioners, rather than asking for yet another highly symbolic step on the EU track while starting to show slippage on the fundamentals for closer association.